15th Street Fisheries in Florida by the Sea! Suga visited 15th Street Fisheries in Florida over Heroes Weekend a few weeks ago. I heard many good things about it and loved that they were by the water with a view, offering freshly grilled Fish. They have different menus for Upstairs and Downstairs, where Downstairs is more casual and Upstairs is Reservations only with a more tempting and pricey menu. My reservation was for a group of 9 on October 15th, a Saturday night at 8:00pm. We were a bit late but they were ready for us nonetheless. We were greeted pleasantly and taken upstairs and seated by our table which was right by the window. Loved the view and activity of boats docking and leaving. The Restaurant was comfortable with rustic décor including old boats, anchors, bottles with chains, lanterns and more. The menu had an insane variety of Seafood dishes to choose from for both Appetizers and Entrees. There were options such as Grilled New York Strip, Slow Roasted Prime Rib of Beef and Grilled Chicken Breast for the Meat lovers. A Wine menu was available as well. The Appetizers came out a bit after 20 minutes, so could have been quicker. We weren’t blown away by the taste of the Appetizers. The Crab Cakes ($16USD) were decent. The Red Shrimp Cocktail ($16USD) had a homemade cocktail sauce that was a bit too tangy, overpowering the shrimp, fresh salsa and cucumber strings. Two of us that ordered the Soup Du Jour ($8USD), a Bahamian style Conch Chowder, were not too fond of it. To me it tasted like a thick Canned soup. The Fisheries Salad ($10USD), however was the winner. 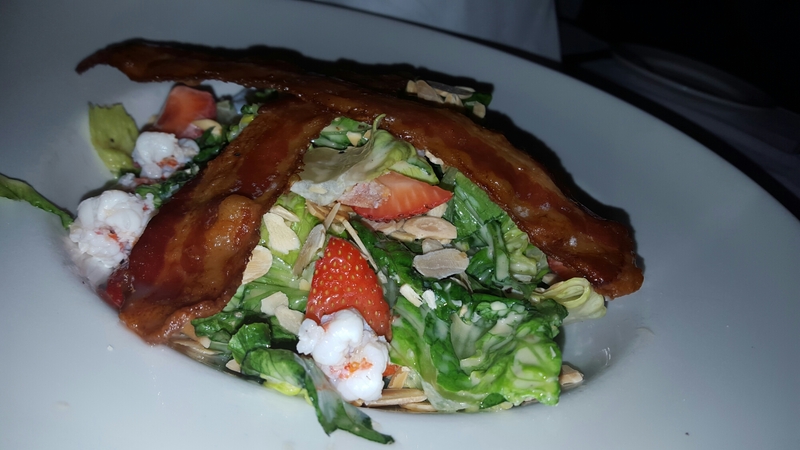 It was a huge, tasty salad filled with Romaine lettuce, Wild Florida Rock Shrimp, Applewood Smoked Bacon, Sliced Almonds, Fresh Strawberries and Papaya Chutney Dressing. Thankfully, the Entrees were a complete 180 in quality compared to the disappointing Appetizers. 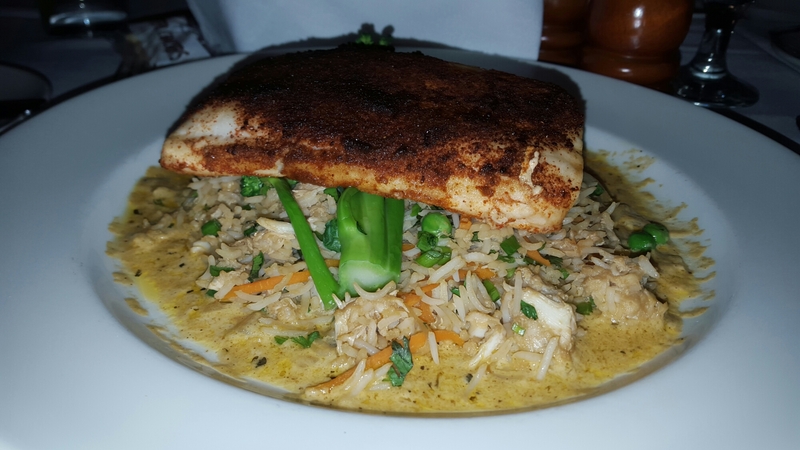 I had the Dry Rubbed Mahi Mahi ($32USD) with crab fried rice, sautéed brocolini and brandy blackened cream sauce. The crab fried rice infused with the brandy blackened cream sauce excited my taste buds. My Mahi Mahi was well cooked and I enjoyed it. Everyone else was happy with their Entrees as well. 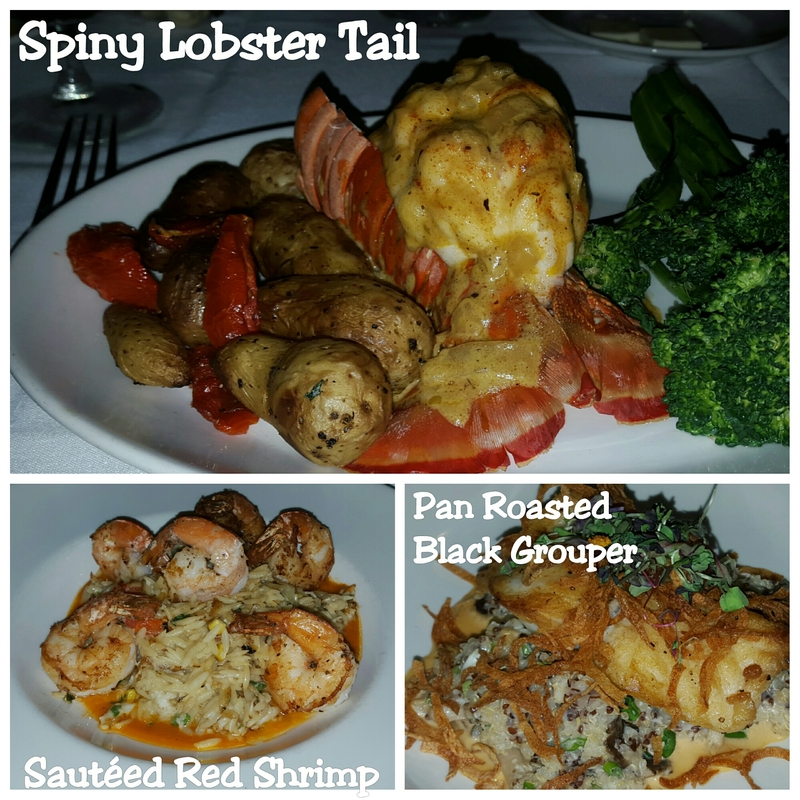 Some of which included Sautéed Red Shrimp ($34USD), Spiny Lobster Tail ($37USD) and Pan Roasted Black Grouper ($35USD). I have to highlight that the Pan Roasted Black Grouper was served with red and golden quinoa, wild mushroom, baby clam meat, white Vermont cheddar cheese, lobster sherry cream sauce and potato crisps. It was absolutely fantastic. Entrée Servings were large, the Seafood was fresh, well cooked and the flavours were amazing. At this point, everyone was quite full and content and had no capacity for Dessert. However, there is always one or 2 with a high metabolism like me with the desire to share a huge dessert. Their Dessert menu, including Gluten free options was way too tempting. They had Dessert Martinis, Coffee Drinks and Ports/Dessert Wine listed in addition to Créme Brulee, Cheesecake, Sorbets, Brownies and more! Of course when I saw Lemon Blueberry Bread Pudding ($10USD) with White Chocolate Sauce, Anglaise, served with Vanilla Ice Cream and fresh berries, I could not refuse. Voilà! 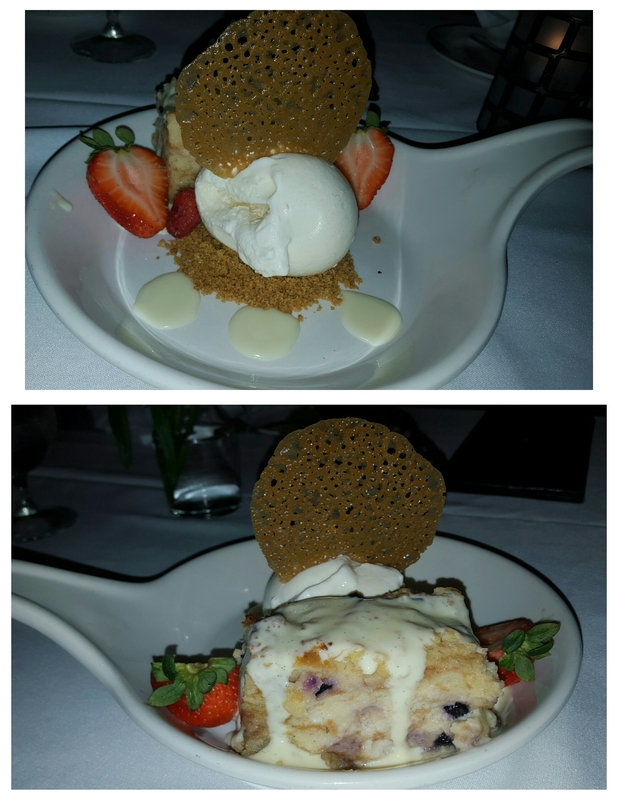 Ok it still wasn’t a Fromage Gourmet Bread Pudding but it was divine! Our waiter needed to touch up on his housekeeping manners towards the end of dinner but we did not allow it to spoil our night and the Managers dealt with and appeased the situation accordingly. The night may not have been perfect but we were full with delicious Entrees, great conversation and absolutely delicious dessert to top it off. Suga would return for sure. 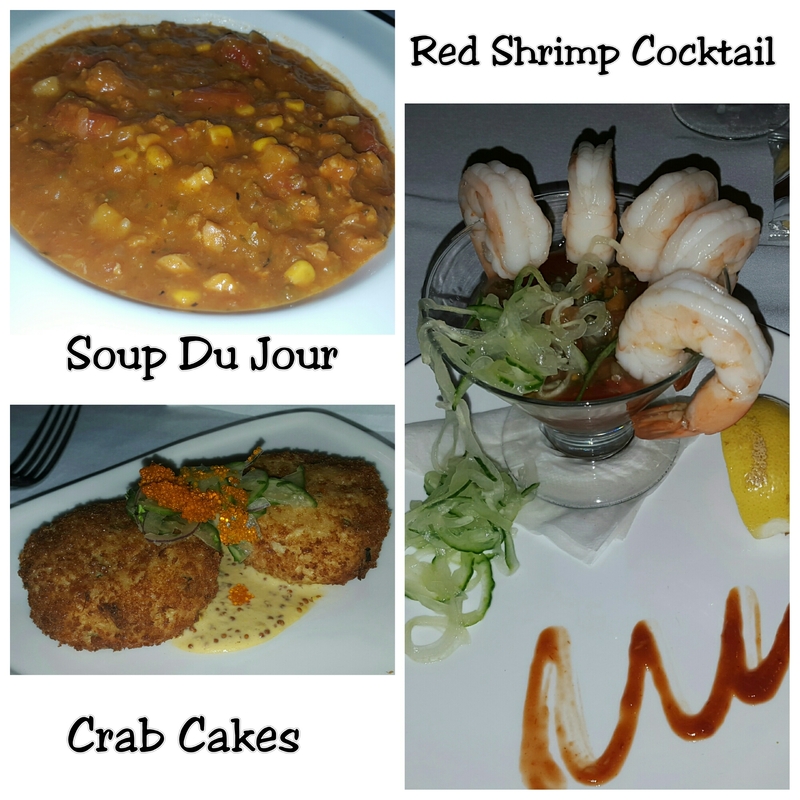 Previous PostSuga’s 5 Nyam & Scram PicksNext PostWhere to Make Reservations for Epicurean for Restaurant Week Jamaica 2016!